Each year the Willow Center Board of Directors, with nominations from the program staff and volunteers, select an outstanding “Volunteer of the Year”. This year it was difficult to select just one – so two outstanding volunteers were selected for recognition, Brenda Sullivan and Nancy Rosch! Brenda has been a Willow Center volunteer and group facilitator for over 4 years, working with the Intermediate, Primary, and Preschool groups. Although Brenda grew up in the deep south, she has lived in the northwest for 35 years. Most of that time was spent teaching in the Lewiston School District until her retirement in 2009. Brenda and her husband, John, established and maintain a farm in Wallowa County. However, she returns to the valley for Willow Center group meetings and events, and in order to help out her teaching friends at Camelot Elementary. When she is not volunteering, Brenda is helping out with the two family businesses, Paradise Tree Farm, and Grande Ronde Guide Services. The volunteers and staff appreciate Brenda’s humor and wealth of experience from working with children. Nancy Rosch has been a Willow Center volunteer since 2008. She works with the Intermediate group, children anywhere from age 9-12. Nancy is a retired instructional assistant, who last worked at Sacajawea Junior High. She greatly enjoys working with children and youth. On a personal note, she is married to Ray and has two adult children and two grandsons, who are the light of her life. She has a love for gardening, cats, church and the ocean! Nancy always seems to give that little extra touch for kids that have a special need, for example, making homemade gluten free treats for those that are on a restricted diet. 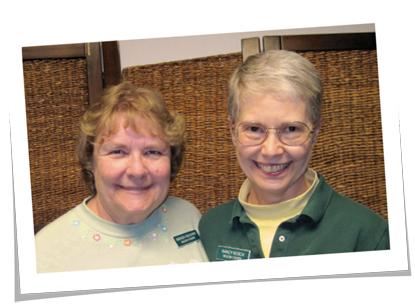 Brenda and Nancy are consistently willing to help out with various tasks and fundraising events that benefit the Willow Center. Both of these wonderful ladies (and their husbands) have been volunteers for Camp Erin! We extend thanks and gratitude for your commitment to the loving care for the children and families we serve and the mission of the Willow Center! We appreciate and thank all our volunteers – who are the Heart of the Willow Center program! Become a Willow Center volunteer! Click here to find out about all of the volunteer opportunities available.